The AK8130B is a member of AKEMDs low power multi Clock Generator family designed for a feature rich DTV or STB, requiring a range of system Clocks with high performance. 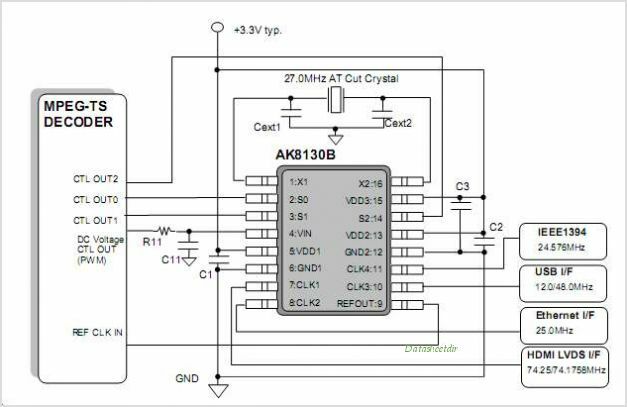 The AK8130B generates different frequency Clocks from a 27MHz crystal Oscillator and provides them to up to four outputs configured by pin-setting. The on-chip VCXO accepts a voltage control input to allow the output Clocks to vary by 110 ppm for synchronizing to the external Clock system. Both circuitries of VCXO and PLL in AK8130B are derived from AKEMDs long-term-experienced Clock device technology, and enable Clock output to perform low jitter and to operate with very low current consumption. The AK8130B is available in a 16-pin SSOP package. By AKM Semiconductor, Inc. This is one package pinout of AK8130B,If you need more pinouts please download AK8130B's pdf datasheet. 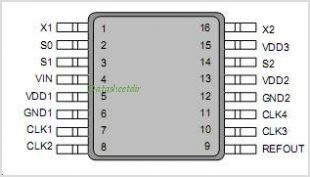 This is one application circuit of AK8130B,If you need more circuits,please download AK8130B's pdf datasheet.